For other people named Tony Adams, see Tony Adams (disambiguation). Tony Alexander Adams MBE (born 10 October 1966) is an English football manager. As a player, Adams played for Arsenal and England, captaining both teams. Adams spent his entire playing career of 22 years as a centre back at Arsenal. He is considered one of the greatest Arsenal players of all time by the club's own fans and was included in the Football League 100 Legends. With Arsenal, he won four top flight division titles, uniquely captaining a title-winning team in three different decades, three FA Cups, two Football League Cups, a UEFA Cup Winners' Cup, and two FA Community Shields. A statue honouring Adams was unveiled at Emirates stadium on 9 December 2011, along with statues of Thierry Henry and Herbert Chapman. He won 66 caps for England between 1987 and 2000 and played at four major tournaments. When his playing career finished Adams went into football management, spending periods in charge of Wycombe Wanderers, Portsmouth, Azerbaijani side Gabala and Spanish side Granada. Adams will be appointed as the 29th President of the Rugby Football League over the summer of 2019. He will succeed Andy Burnham. Born in Romford, Adams grew up in Dagenham and was a pupil at Hunters Hall Primary School from 1971 to 1978 and then Eastbrook Comprehensive School from 1978 to 1983. Adams signed for Arsenal as a schoolboy in 1980. He made his first team debut on 5 November 1983 against Sunderland in the First Division, four weeks after his 17th birthday. Adams became a regular player in the 1986–87 season, winning his first major trophy that season when playing in the Football League Cup Final win over Liverpool at Wembley. Together with Lee Dixon, Nigel Winterburn and Steve Bould, Adams was part of the "famous back four" that lined up in Arsenal's defence, which under George Graham was renowned for its well-disciplined use of the offside trap. On 1 January 1988, he became Arsenal captain at the age of 21; he would remain club captain for the next 14 years until his retirement. Adams's strong discipline of the defence was considered a factor in Arsenal winning the League Cup in 1986–87 and then the First Division championship twice; the first in 1988–89 after a win over Liverpool in the final game of the season; the second in 1990–91, losing once all season. In 1992–93 Adams gained the distinction of being the captain of the first English side to win the League Cup and FA Cup double, lifting the European Cup Winners' Cup the following year. Despite this success, a battle with alcoholism, which started in the mid-1980s, increasingly blighted his life as he was reportedly often involved in fights in nightclubs. On 6 May 1990, Adams crashed his Ford Sierra into a wall in Rayleigh and when breathalysed his blood alcohol level was found to be more than four times the legal drink-drive limit. On 19 December that year, at Southend Crown Court, he was imprisoned for four months (being freed after half of his sentence on 15 February 1991) He became one of the most high-profile recovering alcoholics in the UK; his battle with alcohol is detailed in his autobiography, Addicted, which was released in May 1998 to enormous critical acclaim. Tony Adams statue outside the Emirates Stadium. His recovery and rehabilitation were helped in no small part by the arrival of Arsène Wenger as Arsenal manager in October 1996. Wenger reformed the club's dietary practices and the players' lifestyles. Wenger stuck by Adams following his confessions about his drink problem, and the improvements in the regime probably extended Adams's career by several years. Adams rewarded his manager's understanding handsomely, captaining the club to two Premiership and FA Cup Doubles, in 1997–98 and 2001–02; he is the only player in English football history to have captained a title-winning team in three different decades. In August 2002, just before the start of the 2002–03 season, Adams retired from professional football after a career spanning almost 20 years, his last match being the last league game of the season at home to Everton (the 2002 FA Cup Final was unusually played before the last league fixtures). He played 674 matches for Arsenal (only David O'Leary has played more) and was the most successful captain in the club's history. The number 6 shirt that Adams wore when playing was not used again until the 2006–07 season, when it was assigned to Philippe Senderos, it currently is the squad number of French defender Laurent Koscielny. Just before his retirement as a player, Adams had applied to become manager of Brentford (who had just missed out on promotion to Division One) after the resignation of Steve Coppell, but his application was rejected. Nicknamed "Mr Arsenal", he was honoured by Arsenal with a testimonial game against Celtic in May 2002 with many Arsenal legends playing, including Ian Wright, John Lukic and Adams's fellow back four stalwarts, Dixon, Winterburn and Bould. The game finished 1–1 with Lee Dixon, in his final appearance for the Gunners, getting their goal. In March 2003, just seven months after his retirement and with Arsenal BBC Sport named Adams as the former Arsenal player that the club would most benefit from returning. In 2004, Adams was inducted into the English Football Hall of Fame in recognition of his impact on the English game, and in 2008 he was placed third in the 50 Greatest Gunners poll on the club's website. 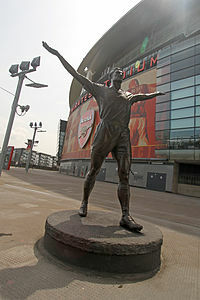 A statue of Adams was placed outside Emirates Stadium in celebration of the club's 125th anniversary on 9 December 2011. Manager Herbert Chapman and Arsenal's all-time top goal scorer Thierry Henry and later Dennis Bergkamp were also immortalised with statues outside the ground. Adams made his debut for England against Spain in 1987, and played in Euro 88. England lost all three games, but Adams scored one of England's two goals in the tournament in a 1–3 defeat to the USSR. He was the first player to represent England who had been born after the 1966 World Cup win. After a highly promising start to his international career, Adams suffered a series of setbacks during the early 1990s. He was surprisingly left out of the 1990 FIFA World Cup squad by manager Bobby Robson, and missed Euro 92 due to injury. However, he still maintained a regular place in defence, and after the retirement of Gary Lineker in 1992, Adams unofficially shared the captaincy of England with David Platt, though Adams became England captain outright before Euro 96, as Platt's place in the side became less secure. England reached the semi-finals of Euro 96, before losing on penalties to Germany. When England manager Glenn Hoddle took the Captain's armband from Adams and gave it to Alan Shearer it was a bitter pill for Adams to swallow. Speaking at a fans' forum in 2008 Adams remarked "I have some resentment over the way Glenn Hoddle gave the captaincy to Alan Shearer instead of me but I can let that go. I reacted positively. I disagreed with him [Hoddle] and he thought Alan could get more penalties being a centre forward. People know my reaction to that". Adams continued to play for the national side, however and he finally appeared in a World Cup finals in 1998. His international swansong was England's unsuccessful Euro 2000 campaign. With Shearer retiring from international football after the tournament, Adams regained the captaincy. However, within months, England lost a World Cup qualifier to Germany in October 2000, the match being the last to be staged at Wembley Stadium before the stadium was torn down for rebuilding. That match was Adams's 60th Wembley appearance, a record. With Sven-Göran Eriksson eventually taking the helm and under increasing pressure for his place from the emerging and improving Rio Ferdinand, Adams retired from international football before Eriksson picked his first squad. He was the last England player to score at the old Wembley Stadium when he scored England's second goal in a 2–0 friendly win over Ukraine on 31 May 2000. This was also his first goal since he scored in a friendly against Saudi Arabia in November 1988, thus making the record for the longest gap between goals for England. Adams was the first, and remains to date the only, England player to make tournament appearances in three separate decades. In total Adams appeared 66 times for England, scoring 5 times. After starting a sports science degree at Brunel University, Adams became the manager of Wycombe Wanderers in November 2003. He was unable to prevent the club's relegation to League Two that season, and although the club were top of the table in August 2004, a loss of form saw them fall down the table. He resigned from Wycombe in November 2004, citing personal reasons. He was succeeded by John Gorman. In July 2005, Adams accepted a trainee coaching role with Dutch side Feyenoord with special responsibility for its Jong team, which is a reserve/junior side. Adams later had a short spell seconded to Utrecht as a first team trainee coach in January and February 2006. While at Feyenoord he also worked part-time as a scout for Arsenal, watching games in Italy, France, and the Netherlands. Adams joined Portsmouth as assistant manager to Harry Redknapp in June 2006, a position left vacant by the departure of Kevin Bond. In his first season as assistant, Portsmouth finished ninth in the Premier League – their highest standing since the 1950s and won the 2007–08 FA Cup. Adams was appointed caretaker manager of Portsmouth in October 2008, alongside Joe Jordan, following the departure of Harry Redknapp to Tottenham Hotspur. He was subsequently appointed full-time manager. He was sacked in February 2009 after just 16 games in charge in which Portsmouth picked up only 10 points. In May 2010, Adams signed a three-year contract to manage Azerbaijani club Gabala FC of the Azerbaijan Premier League. He departed as coach of Gabala due on 16 November 2011, before the end of the 2011–12 season. In October 2012, Adams returned to Gabala FC in the capacity of Sporting Director. On 10 April 2017, Adams was named as manager of La Liga strugglers Granada CF until the end of the 2016–17 season. At the end of the season, Granada were relegated from La Liga ending their 8-year stay in the top division. Adams lost all 7 games as manager and was subsequently sacked. In September 2000, as a result of his own experiences with alcoholism and drug addiction, Adams founded the Sporting Chance Clinic, a charitable foundation aimed at providing treatment, counselling and support for sports men and women suffering from drink, drug or gambling addictions. The clinic, which works to the twelve-step programme philosophy of Alcoholics Anonymous is based near Liphook in Hampshire and includes Kate Hoey, Alex Rae and Elton John as patrons, and is supported by the Professional Footballers' Association. Adams's former Arsenal and England teammate Paul Merson, himself a recovering alcoholic, is also a patron of the charity. Adams is a Patron for NACOA—a charity that provides information, advice and support for anyone affected by their parents' drinking. He is also a Patron for charity School-Home Support (SHS). SHS helps disadvantaged children and young people overcome barriers to education such as poverty, domestic abuse and housing issues. Adams remains a popular figure with Arsenal fans. In December 2008, more than six years after he left the club, Adams led out his Portsmouth side onto the pitch at Arsenal to be greeted with the chant "There's only one Tony Adams" by Arsenal fans. On 30 December 2009 Adams was the guest editor on BBC Radio 4's Today programme. In the 1997 motion picture The Full Monty, Horse (played by Paul Barber) specifically mentions Adams while attempting to explain that a particular part in their dance routine was similar to the "Arsenal offside trap." In the debut album Rock Art and the X-Ray Style by Joe Strummer and the Mescaleros, the opening track is named 'Tony Adams'. "Ali in the Jungle", a song by the English rock band The Hours, refers to him in its lyrics. In Robert Muchamore's CHERUB series, protagonist James Adams chooses the middle name Anthony and last name Adams after Tony Adams when he joins CHERUB. ^ a b c Hugman, Barry J., ed. (1999). The 1999–2000 Official PFA Footballers Factfile. Harpenden: Queen Anne Press. ISBN 978-1-85291-607-7. ^ a b Brodkin, Jon (14 May 2002). "A night out for the Adams family". The Guardian. London. Retrieved 28 October 2008. ^ "Referendum: Is Thierry Henry Arsenal's greatest ever player?". Arsenal Land. Archived from the original on 22 April 2006. ^ "Football personalities of Barking and Dagenham" (PDF). London Borough of Barking & Dagengham. Archived from the original (PDF) on 5 June 2012. Retrieved 22 February 2014. ^ a b Arsenal.com (5–19 May 2008). "Gunners' Greatest Players – 3. Tony Adams". Official Arsenal Website. Archived from the original on 12 December 2008. Retrieved 24 November 2008. ^ "Tony Adams". Ask Men. Retrieved 22 February 2014. ^ Stillman, Tim (25 July 2010). "Stick Your Two Points Up Your Arsenal". Vital Football. Retrieved 22 February 2014. ^ a b Paul Whittaker (March 1998). "Adams turns his back on alcohol". Alcohol Works. Retrieved 22 February 2014. ^ "Brentford snub Adams". London: BBC Sport. 27 June 2002. Retrieved 8 January 2009. ^ Fordyce, Tom (24 March 2003). "Blast from the past: Part one". BBC News. ^ "Teary Henry as Arsenal unveil statues to former French star, Adams and Chapman". Daily Mail. London. 10 December 2011. ^ "Tony Alexander Adams – International Appearances". Retrieved 24 October 2008. ^ "Adams resigns as Wycombe manager". London: BBC Sport. 9 November 2004. Retrieved 25 March 2010. ^ Stanton, Chris (3 June 2009). "Exclusive: Italian job for Gunners". Setanta. Archived from the original on 7 June 2009. Retrieved 22 February 2014. ^ a b Ashdown, John (28 October 2008). "Adams set to be unveiled as new Portsmouth manager". The Guardian. London. Retrieved 28 October 2008. ^ "Adams appointed new Pompey boss". BBC. London. 28 October 2008. Archived from the original on 17 January 2010. Retrieved 28 October 2008. ^ Ron Parrish (9 February 2008). "Pompey confirm Adams axe". Sky Sports News. Retrieved 11 February 2009. ^ Esslemont, Tom (11 May 2010). "Tony Adams' grand plans for Azerbaijan football club". BBC. Retrieved 12 May 2010. ^ "Tony Adams quits as manager of FC Gabala". Independent. 18 November 2011. Retrieved 22 February 2014. ^ "Tony Adams returns to FC Gabala in Azerbaijan – BBC Sport". www.bbc.co.uk. Retrieved 21 April 2019. ^ "Tony Adams named as Granada manager until end of season". The Guardian. 10 April 2017. Retrieved 10 April 2017. ^ "Tony Adams talks about hifccfdds role at Granada CF". Granada CF website. 10 April 2017. Retrieved 10 April 2017. ^ "Tony Adams' Granada are relegated – now the real challenge starts". The Independent. 29 April 2017. Retrieved 21 April 2019. ^ a b c d e f g h i j k l m "Tony Adams". 11v11.com. Retrieved 21 April 2019. ^ "Games played by Tony Adams in 1996/1997". Soccerbase. Centurycomm. Retrieved 21 April 2019. ^ "Games played by Tony Adams in 1997/1998". Soccerbase. Centurycomm. Retrieved 21 April 2019. ^ "Games played by Tony Adams in 1998/1999". Soccerbase. Centurycomm. Retrieved 21 April 2019. ^ "Games played by Tony Adams in 1999/2000". Soccerbase. Centurycomm. Retrieved 21 April 2019. ^ "Games played by Tony Adams in 2000/2001". Soccerbase. Centurycomm. Retrieved 21 April 2019. ^ "Games played by Tony Adams in 2001/2002". Soccerbase. Centurycomm. Retrieved 21 April 2019. ^ a b c "Managers: Tony Adams". Soccerbase. Centurycomm. Retrieved 2 January 2018. ^ Sengupta, Kim (21 August 2000). "Tony Adams to provide safe haven for alcoholic and drug-addict footballers". The Independent. London. Retrieved 28 October 2008. ^ "Tony Adams". Bristol: NACOA. 15 April 2009. Retrieved 22 February 2014. ^ "School-Home Support (SHS) announces new charity patron – Tony Adams MBE". London: School-Home Support. Retrieved 17 March 2017. ^ Cass, Simon (29 December 2008). "Arsenal 1 Portsmouth 0: Same old song as Adams falls short". Daily Mail. London. ^ "Tony Adams reveals he underwent life-saving heart operation". Mail Online. 4 November 2015. Retrieved 21 April 2019. ^ SongMeanings. "The Hours – Ali In The Jungle Lyrics". SongMeanings. Retrieved 21 April 2019. ^ Muchamore, Robert (2004). CHERUB: The Recruit. CHERUB. 1. Hodder. ISBN 978-0-340-88153-8. ^ a b c d Mannion, Damian (5 October 2011). "Arsenal's greatest ever captains: Tony Adams, Patrick Vieira, Frank McLintock, Wojciech Szczesny?". TalkSport. Retrieved 17 May 2017. ^ "Tony Adams: Overview". Premier League. Retrieved 15 April 2018. ^ "Mercantile Credit Centenary Trophy 1988". Football Database. Retrieved 26 April 2017. ^ "1991/92 F.A. Charity Shield". Footballsite. Retrieved 27 September 2017. ^ Moore, Glenn (10 August 1998). "Football: Arsenal show United little charity". The Independent. London. Retrieved 18 July 2014. ^ "Too much too young?". BBC Sport. Retrieved 7 July 2017. ^ a b c "England Players – Tony Adams 1988". England Football Online. Retrieved 7 July 2017. ^ "Team of the Century: 1997–2007 – the Premiership's finest of the last decade". GiveMeFootball.com. Give Me Football. 5 September 2007. Archived from the original on 21 October 2008. Retrieved 2 June 2016. ^ "Your overall Team of the Century: the world's greatest-ever XI revealed!". GiveMeFootball.com. Give Me Football. 6 September 2007. Archived from the original on 21 October 2008. Retrieved 2 June 2016. ^ a b "Owen miss nets award". Daily Telegraph. Retrieved 7 July 2017. ^ a b "Fergie & Giggs honoured". Sky Sports. Retrieved 7 July 2017. ^ Brodkin, Jon (12 June 1999). "Adams seals recovery with a gong". The Guardian. Retrieved 7 July 2017.